Bournemouth, The Medici Galleries, Exhibition of Oil Paintings by Laura Knight, 1926. London, Royal Academy, Exhibition of Paintings and Drawings by Dame Laura Knight, D.B.E, R.A., 1965. 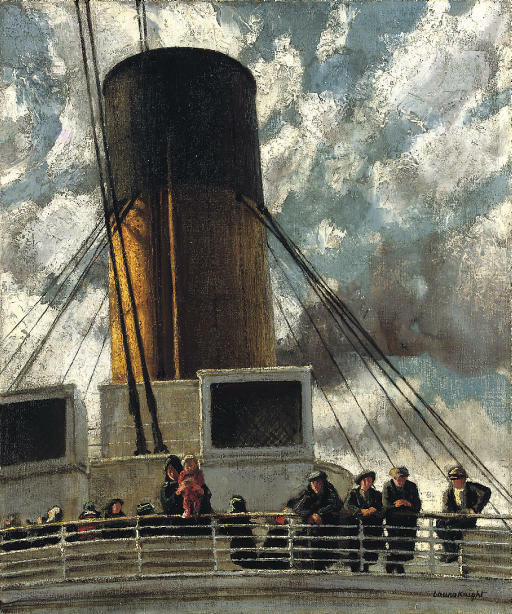 The picture dates from 1922, and was inspired by scenes witnessed aboard the Olympic as Laura Knight crossed the Atlantic for her first visit to the United States. The 1920s witnessed the height of her career, as scenes depicting Cornwall and the Diaghilev Ballet gained in popularity amongst the picture-buying public. Together with the French artist Lucien Simon (1861-1945), Knight was invited by Homer St Gaudens, Director of the Fine Art Department of the Carnegie Institute at Pittsburg, to be the European representatives on the Jury of Award at an International Exhibition in Pittsburg, P.A., U.S.A. In her memoirs she recalled: 'It is impossible to describe fully the wonderful weeks spent in America with Homer St Gaudens and Lucien Simon. We were welcomed and entertained in royal fashion. After executing our duties in Pittsburg, we experienced millionairism, as well as spending one whole night in the inferno of Carnegie steelworks, a picture of white-hot-hell. We journeyed from state to state, seeing the sights, sleeping on trains, sleeping in magnificent women's clubs - eating and drinking on such table linen as I have never seen - gazing in awe at the Washington display of cherry blossom, the White House, the Lincoln Memorial ...'. Working on her biggest solo exhibition - to be held at the Alpine Galleries, shortly after her return from America, Laura undertook several studies of the emigrants on board the Olympic. Built for the White Star Line (which also owned the Titanic and Britannic), it enjoyed long and illustrious service crossing the Atlantic between 1911 and 1935. Known as the 'Old Reliable', it was used as a troop ship in the Gallipoli campaign in the First World War, and was the only merchant ship to have sunk a warship (U boat 103) at that date. We are grateful to R. John Croft, the artist's great nephew, for his help in preparing this catalogue entry. The picture will be featured in his forthcoming catalogue raisonné of the artist's work.